Nestlé is running “Kit Kat Klock”, an ambient campaign London designed to make the most of the move to daylight saving in the UK this weekend. The ambient campaign ran with Kit Kat’s strapline, ‘have a break’. 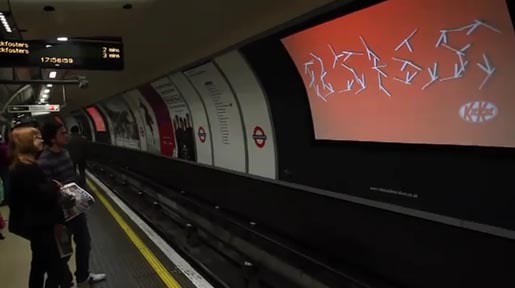 A series of ticking clock hands appeared on 120 CBS screens at twenty London Underground stations during the evening of 24th March. The clock hands move around to eventually spell the word ‘BREAK’. The same film was also projected on walls at five different London locations where there was late night work going on. The Klock campaign was developed at JWT London by executive creative director Russell Ramsey, creative director Jason Berry, creative team Hugh Todd, Adam Scholes and Richard Buchannan, producer Toby Clifton. Footage is by Grant Raphael. Motion graphics are by James Ireland.